The iCN520 was announced by NavMan just after the PocketGPSWorld.com meeting in Wales. Tim was given the opportunity of putting one through its paces for a few days. After getting the unit home he was eager to unpack the box of goodies and see what this new dedicated GPS unit had to offer. The Navman iCN520 is an upgraded version of the iCN510. It is a complete Personal Navigation Device (PND) with all the required components integrated into a small unit that can slip into your pocket. Complete with a windscreen mount, power supply and remote control all you need to do is to connect the power to a cigarette lighter socket select your destination and off you go. maps on the MMC are preloaded as shown. You are not heavy-handed! It's a very poor design and I'm surprised that the keypad hasn't been redone so that the cetre button is separate from the four-way directional pad. I agree the design is bad, and this is something that Navman have recognised and addressed on the new models coming out soon. Both the 320 and 550 replace the multifunction button with 5 individual buttons. A much more practical arrangement. I also have problems with the 5 way button on the Orange C500 as well. In general these controls are a good idea, but a failure when implemented. Read review, but cannot see if you can attach external, antenna. 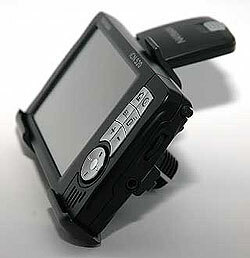 Car windscreen ATHERMIC, always an issue with units which come with fixed antenna and no external connector for aerial. If you own a car with a coated windscreen or a heated windscreen it is either impossible to get a GPS signal, or the signal is very weak. In this case you will need to use an external antenna. This connects into a socket which is protected by the grey cover. I'm pleased with my 520. Just one thing - you say in your review that if you have a heated windscreen it is impossible to get a signal or only a weak one. Well in my Mondeo with heated screen it works fine and rarely drops the signal. I`ve had my 520 for a month or so, I have a Picasso with heat reflecting screen, but I put the 520 on a little window at the side of the dash (in front of the front door) and have no probs. saves buying an aerial. Can the 520 run on the internal battery without having to plug the until to the lighter socket? IF so how long will the internal battery last for? I suppose I should have qualified that and mentioned the circumstances. My Father was supposed to be the Guinea Pig testing the 520, he drives a 2005 Ford Focus C-Max. We had a strong fix outside the car, but nothing inside on the dash. My 520 runs quite happily for several hours on it's internal battery. It complains of low battery when there's only 33% left, but I've found you've still got well over an hour left in the battery at that point. I now have the 520 after having the 510 for almost a year and getting fed up with not getting a signal on the 510 when i switched it off for say 10 mins when it had previously been working fine for an hour 's or so drive. Everyone of this forum kept saying they had no problem getting a signal anytime, so I decided to replace mine and as I say I now own the 520. I still have the inconsisitent signal pickup, even though it works fine when it aquires one. If anything it is slower than the 510 at getting the inital fix. The other problem I have found is that the 520 for some reason suffers more screen reflection in bright sunshine than the 510 did. I had a screeny on the 510 and so put one on the 520 put it was terrible. Perhaps I need to try a differnt make of screen protector. From what I remember, I sure that one of the zoom settings has been removed so you get one less, but I may be wrong on this. The backlit buttons on night settings are a great idea, but the switch over of the esc and map view buttons takes getting used to. The speed cameras came preloaded on my machine and these were the actual speed related downloads which I could not fit on my 510 as this only allowed 18 POI's. The 520 allows 25 now. The new software is slower than the one on the 510 and therefore the little hour glass stays on screen a few seconds longer when you input a search. I've had the 520 for a week now and will put it to more of a test as the weeks go on if anyone has any questions? MiddleMan, you said ..."The other problem I have found is that the 520 for some reason suffers more screen reflection in bright sunshine than the 510 did." Is that possible? I think the 510 is really bad from that respect and often completely unuseable on a sunny day because of the reflections it picks up. If the screen was sorted out and full postcode made available it would be a great unit. By the way, get an antenna, it will sort out the loss of signals. Its the best investment I made and now have no problems on that front with full reception at all times. Hello, I am thinking of buying the navman 520, could someone please advise how good the speed camera detection is on this? and what features it gives you for detecting speed cameras? I have put the speed cams on my 520, I have`nt put the ones giving the speed restriction, I have put the BMPs on so I get a `ping` and the bmp for whichever type of camera it is. (gatso, mobile, temp or red light) I have chosen to be alerted at 300 feet, so far it works well. I am alerted to a camera being in the vicinity, I know what type of road I`m on and don`t need the speed warning, which is why I didn`t put them on.